Join us for a morning of book chat with gifted writers, hosted by bestselling author and journalist Dave Kenny. John Boyne critiques the backbiting literary world in his latest book A Ladder to the Sky (Penguin). Carmel Harrington’s touching new novel A Thousand Roads Home (HarperCollins) depicts a family home under threat. 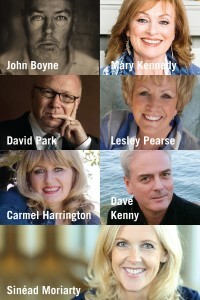 Mary Kennedy treats readers to insights from her own domestic life in Home Thoughts from the Heart (Hachette Ireland). In Travelling In A Strange Land (Bloomsbury), David Park offers a moving account of a father’s journey to bring his son home. Bestselling author, Sinéad Moriarty treats us to her thirteenth novel, Our Secrets and lies (Penguin). Lesley Pearse explores suburban secrets in her new novel, The House Across the Street (Penguin). Complimentary refreshments will be served during a 30-minute interval.